I am inheriting a pair of these in mahogany from my late father. I am going to be cleaning out the house at the end of the month and apparently he doesn't have the boxes that the speakers came in. Does anyone have a suggestion as to how I might find boxes, or otherwise protect these speakers so that I can transport them from Oregon to Wisconsin? clarity of sound, the Cambridge Sound Works Towers brings us a step closer to visualizing sound, i use a vintage Marantz pre-amplifier sr670 and and a vintage Acurus amplifier 125x5 in stereo mode, and the Towers come to life with a surprisingly wholesome lower frequencies, you can play these speakers at fairly loud volumes and not disturb your neighbors with heavy bass, these speakers do high definition sound very well, i don't really need the subwoofer since these speakers put out a decent amount of bass, the Towers have a very small footprint, they will fit anywhere and put out beautiful sound but they really need more than 100 watts to really shine, they are powerful, elegant, and they are well made, if you are lucky to find a pair of the Cambridge Sound Works Towers or the smaller brother Tower 2 don't hesitate to get them you will not believe how nice they look and sound, i really like the second tweeter they added in the back face, it makes a huge difference in the sound imaging projection. the weaknesses i found in the Cambridge Sound Works Towers is the weight, this is good and bad because a quality built floor speaker should be solid and heavy, compared to my old Marantz sp-1500's the Cambridge Sound Works Towers are light, it is a weakness if you can't lift heavy speakers, another weakness i found in the Towers is the wire terminals are under the speaker so you have to lay the speaker flat on the carpet to connect it, i like the placing of the wire terminals in the Cambridge Sound Works Towers 2 the smaller models, which has the wire terminals in the conventional placing of most speakers in the back face towards the base. great value and sound. Sound as good if not better than speakers costing 3 times as much. You can't go wrong with these. WOW is all i can say. After testing Martin Logan, Some B & W, I cam across this vintage set of Tower CSW on CL. Best money I could of spent. I still feel I owe the guy a donation receipt for his donation to me. If you can find these any where, pick them up! you will not regret it. I bought these speakers from someone on ebay for $150 and they still sound awesome. I just wish I could find how many watts these can handle. You can't go wrong with vintage CSW. Less money with great sound! Why spend the big bucks when you don't have too. bought a second pair on the used market. They replaced a pair of a/d/s/ 1090 towers, which are a pretty decent speaker. The first pair I owned have constantly delighted me since I bought them. Almost every time I listen, I say "wow!". They provide great detail and a fantastic three dimensional soundstage. Spatial details are abundant. For instance, on the Bill Evans "Waltz with Debby" CD, I can tell that the drummer was on a platform, raised above the level of the piano and bass. On classical CD's and LP's, the soundstage and instrumental detail are amazing. I am running the new pair with an a/d/s/ powered sub, and the combo is outstanding. The lacquered walnut finish is beautiful. Used, these speakers are a fantastic value for the money. You can pick them up for a few hundred dollars if you are lucky enough to find them. Give them a try - you can't lose. CSW is not a "big name" audiophile vendor, but this speaker provides big time performance. These are very nice speakers, and a superb deal on the used market. I picked up my pair for $400 - lightly used in the box. The bi-polar speakers that are rear firing give this speaker very good imaging - I hear spatial details I have never heard before on familiar recordings. The dual 8" woofers give the speaker excellent, weighty bass into the low 30 Hz. range. Wide, wide soundstage with orchestral works. Tonal balance is excellent - voices and stringed instruments sound natural and real. 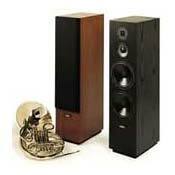 Like any well designed speaker, they sound good with any type of music - rock, jazz, folk, classical. They are heavy and very well built. I am very happy with these speakers, which I use with Yamaha separates. I've had a lot of good speakers over the years, and these are among the best I've owned. These are among the most non-fatuguing speakers I have listened to regardless of price. Acoustic instruments (eg., guitars and mandolins) sound remarkably realistic through these speakers. Bass could be a little tighter and deep bass sounds best with the help of a subwoofer. On rock music, I sometimes miss the immediacy of a direct radiating speaker. These have been my references for several years now. They are remarkably relaxed sounding, with fairly deep bass, a nice, accurate midrange, and smooth, non-fatiguing trebles. The bipolar radiation pattern gives up a little bit in terms of pin-point accuracy for a large and slightly diffuse but pleasing soundstage. Instrumental timbres are quite accurate through these speakers. Never had to deal with customer service. Good all around sound quality, wide soundstage. If one doesn't take price into consideration, these are excellent speakers. Bass is strong while midrange and treble are resonably well defined. In my opinion a subwoofer is still needed for HT and bass heavy music (rap,techno..), but one could say the same thing about most any tower speaker without a built in powered subwoofer. Now if you do take price into consideration, at 899 they are a great buy. You could do a lot worse with much more expensive speakers for sure. As for the one star reviews, those are courtesy of GDS and from the similar language used on a few other negative reviews on other speakers in the Cambridge line, I'm sure he's been "reviewing" other products as well. He seems quite fanatical in any event, going in the face of professional reviewers of sites like SMR home theater. Ive heard Martin Logans, Vienna Acoustics, Sonus Faber, etc. All-around great sounding speakers. Very good quality wood cabinets. Good leveling spike system. Price is unbeatable. I have always had B&W speakers since 1985 starting with the DM3000 series. I've been auditioning new B&W 804($3500.00) and 803 (5,000.00). I also took home a pair of Linn, Espek that sell for $3700.00 home to compare to the B&W's. After listening to these for several days I decided that the 803 were the best. Linn was second and the 804 third. I was ready to buy the 803's. I then received a sale brochure from Cambridge Soundworks. I had recently bought a mini system for my daughter last Christmas. (which I thought was one good sounding little system.) I looked at the ad for the Tower speakers, on sale from $1499.99 to $899.99. My credit card company also gave me an extra 20% off. So for around $720.00 and free shipping I decided to give them a listen. I had auditioned a few lower priced speakers in the range of $2000.00-$3000.00 (Infinity and Kef etc. )but had dismissed them because of the poor quality sound compaired to the B&W's. Cambridge Soundworks also gave me a 45 day return if I didn't like them. How could I go wrong? When I received them I hooked them up bi-wire to my Luxman amp. and preamp. The Tower speakers didn't have the cheap sound of the Kef or Infinity's. In fact they sounded better than the B&W 804's. I know I'm getting older and my hearing is not as good as when I was 20, but the Towers sounded great. I would rate these as one of the better speakers under $3500.00 range. My choice would be to buy the B&W 803's for $5000.00 for the better sound. But for a saving of over $4200.00 plus tax, the 803's can stay at the dealers showroom. I'm keeping the Towers and I'm extremely happy with them.